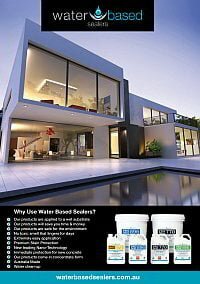 GraffiGuard 2030 Ecological is your first-line treatment for removal of spray paints from brick, concrete, wood, plaster, render or any other porous, or less porous substrates. Once the graffiti has been removed, protect your surfaces with ProtectGuard, ProtectGuard HD or Super Anti Graffiti to ensure any further graffiti can be removed even more easily! GraffiGuard 2030 Ecological graffiti remover is the latest technology from Guard Industry‘s extensive research into graffiti removal. Incidences of unwanted graffiti and tagging have increased a lot over the past few decades. As a result Graffiti removal has become a multi-million industry. Sadly, most of the products used to remove graffiti are extremely toxic. 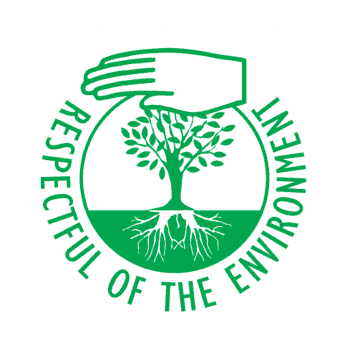 Toxic graffiti removal products are harmful both to humans and the environment.These harmful chemicals are currently used all over the world. Unfortunately, their ill effects on people and the environment remain long after the graffiti has gone. Therefore, the true cost of fighting graffiti is much more than just the cost of chemicals and labour. However, Graffi Guard 2030 Eco graffiti remover is non hazardous. 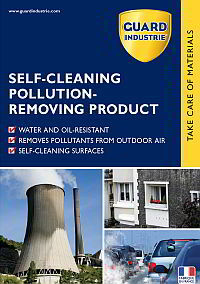 It contains no chlorinated, fluorinated or petroleum based solvents (NMP, NEP etc). It’s biodegradable and contains less than 175g/l VOC’s. As such it’s an excellent, Eco option for those concerned with not only their own health, but with that of their employees, the public and the environment in general. 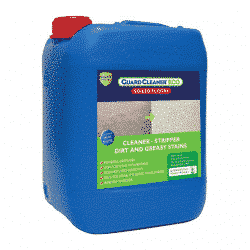 Quickly and easily remove ink and paint based graffiti from porous surfaces. It is intended as first line treatment for all types of ink and paint graffiti. Being viscous, Graffi Guard 2030 Eco is very effective on untreated porous surfaces, where long dwell times are often required. Since Graffi Guard 2030 Eco is a powerful graffiti removal product it is not recommended for use on most painted surfaces. But, it is safe to use with most types of anti-graffiti coating. However, it always pays to do a small test prior to use. 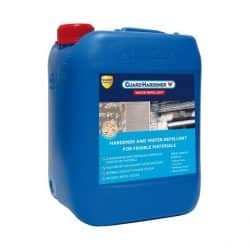 It is safe to use on surfaces treated with Protect Guard and Protect Guard HD. Please follow application guides as found in the technical data sheet. Is your building getting tagged often? The best deterrent is to remove graffiti as soon as possible. Offenders want their tags to be seen. They want the notoriety. If you remove tags before anyone gets to see them, you rob taggers of their glory (or infamy more like it). They will quickly move on and look for a more permanent canvas for their ‘artwork’. To quickly and efficiently remove graffiti is pays to have a graffiti management strategy in place. This requires more than just having a reliable graffiti remover. Your first line of defence is a good quality anti graffiti coating. Graffiti is far easier to remove from surfaces that have been pre-treated with a protective coating. Such coatings prevent paints and inks from soaking into porous surfaces. Unfortunately most permanent anti-graffiti coatings can change the look of the surface or degrade and discolour with time. Protect Guard and Protect Guard HD are different. They are completely invisible sealers that stop graffiti from soaking into the surface. They also keep out water, oils and all types of stains. In addition, Graffiti Guard 2030 Eco graffiti remover will clean graffiti from these products without damaging the seal itself. This means that the sealer will continue to provide ongoing protection against future graffiti attacks. For the ultimate in graffiti protection use Super Anti Graffiti – Multi Surface. This product provides a permanent protective film that allows graffiti to be removed with just cold water! Graffiti can be wiped off with a wet rag if removed within the first few hours. 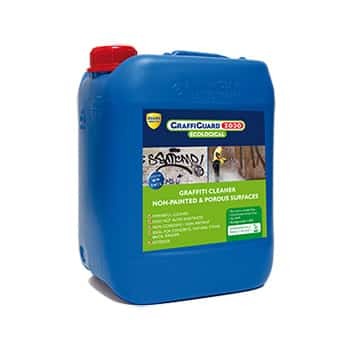 For longer dry times just use a low pressure (~1,000 psi) cold water pressure cleaner. No chemicals are needed at all! Super Anti Graffiti lasts for up to 20 cleaning cycles. At the end of it’s life it can be restored by applying another coat over the top. Re-application is easy and seamless. Super Anti Graffiti Multi Surfaces can be applied to all kinds of surfaces, including, stone, brick, metal and painted surfaces. It is available in either a matte or gloss finish. It also enhances the colour of porous surfaces. This effect can be avoided, where desired, by use of special primers. Fight graffiti without doing more harm! Choose graffiti management practices that work! 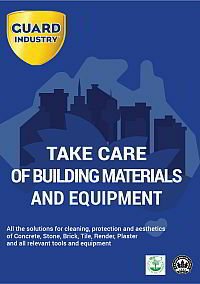 Choose a graffiti remover and anti graffiti coatings which are safe for people and the environment. 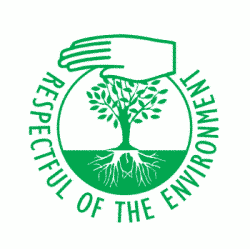 Choose eco-friendly Guard Industry products! 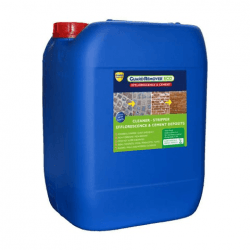 GraffiGuard 2030 Ecological is designed to be used outdoors for the removal of all spray paints from porous surfaces such as brick, plaster, natural stone, concrete, render, wood etc. 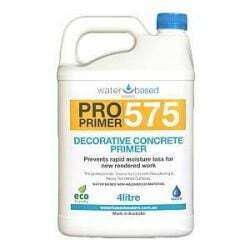 It’s viscosity allows it to work perfectly on porous substrates over a long duration of time. 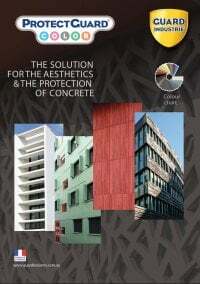 GraffiGuard 2030 Ecological also works efficiently on less porous substrates such as tiles etc and surfaces that have been protected with ProtectGuard. GraffiGuard 2030 Ecological is used to remove all types of ink and paint graffiti. Apply neat (DO NOT DILUTE). 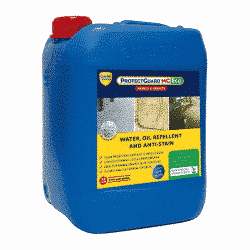 For optimum results use GraffiGuard 2030 Ecological on wet surfaces. 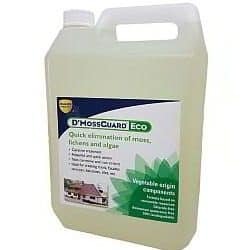 On porous surfaces in particular, wetting the surface before applying GraffiGuard 2030 Ecological will prevent the dissolved paints from penetrating into the material. Coat the graffiti liberally with undiluted GraffiGuard® 2030 Ecological, thenw ork well in with a brush. Leave to act for 10 to 15 minutes until the paint has dissolved, then rinse off with plenty of hot water under pressure. If residue or stains of paint are still nto removed, repeat the operation or use GraffiGuard 2010. Once the graffiti is gone, rinse the surface down with plenty of water. For old graffiti, a plastic film can be placed over GraffiGuard 2030 Ecological and left for a few hours. Results depend on the temperature. Avoid applying below 5°C. a mixture of solvents of organic origin. Respiratory protection: under normal conditions of use where adequate ventilation is available, no special respiratory protection equipment is needed. Hand protection: Wear latex gloves. Skin protection: Wear protection clothing for the skin with long sleeves. Eye protection: wear protective goggles. If swallowed: Do not induce vomiting. Contact a doctor or a specialist.